Life span: 5 years or more. Colors: White, Black, Blue, Brown, Agouti Pattern (Agouti, Chinchilla, Opal), Shaded (Siamese Sable, Light, Dark, Siamese Smoke, Sealpoint, Sooty Fawn), Tan Pattern (Black Fox, Blue Fox, Chocolate Fox, Lilac Fox, Sable Marten Dark, Marten Medium and Light), Fawn, Orange, Steel, Butterfly. 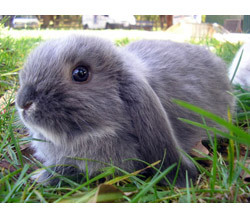 Dwarf Lop Rabbits are in appearance as you would expect – small rabbits with floppy ears. Dwarf Lop Rabbits have a soft, dense coat that comes in a variety of colours including black, white, blue, agouti, chinchilla, sable, seal point and fawn. Holland Lops are generally fairly calm, though some, especially females, can be easily startled and shy.